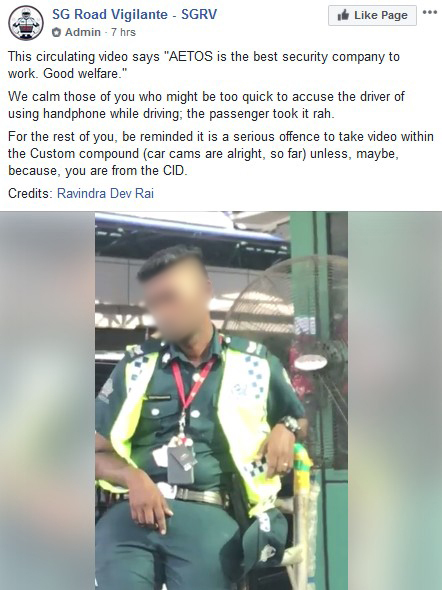 Aetos is investigating an auxiliary officer who was caught on camera sleeping while on duty, said the security management company in response to a Stomp query. The 12-second clip& shows the officer apparently sleeping with a fan blowing at his back. Stomp understands that the only checkpoint where Aetos officers are deployed at is Woodlands Checkpoint. The officer in the video was on duty at the time of the incident. Aetos told Stomp in a statement on Friday (Sep 7): "With regards to the Facebook video, we are aware of the incident. "The officer in question has been removed from duty and is currently under investigation. "Aetos adopts a zero tolerance policy towards such lapses in security. Any officers caught sleeping on duty will be dismissed from service."